Monodehydroascorbate reductase (MDAR or MDHAR), which is responsible for growth, development and stress response in plants, is a key enzyme in the maintenance of the ascorbate acid (AsA) pool through the AsA–glutathione (AsA–GSH) cycle. High temperature affects a broad spectrum of cellular components and metabolism including AsA–GSH cycle in plants. In rice, however, the detailed roles of OsMDHAR4 in resistance against heat stress remains unclear. Here, we report that OsMDHAR4 protein was localized to the chloroplasts. OsMDHAR4 expression was detected in all tissues surveyed and peaked in leaf blade. OsMDHAR4 was responsive to multiple stresses and was relatively strongly induced by heat treatment. In comparison with wild type, the osmdhar4 mutant exhibited improved tolerance to heat stress, whereas OsMDHAR4 overexpression lines exhibited enhanced sensitivity to heat stress. Moreover, we found that suppression of OsMDHAR4 promoted stomatal closure and hydrogen peroxide accumulation, and overexpression of OsMDHAR4 increased stomatal opening and decreased hydrogen peroxide content in rice leaves. 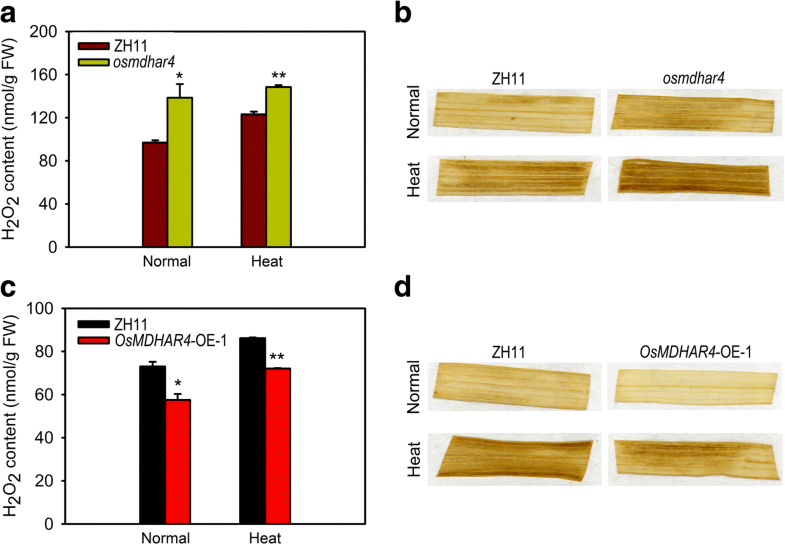 Taken together, these results indicated that OsMDHAR4 negatively regulates tolerance to heat stress by mediating H2O2-induced stomatal closure in rice. Extreme temperature is one of the serious threats affecting crop production and distribution worldwide (Yokotani et al., 2008). In plants, a transient increase of 10–15 °C above ambient, is generally considered as heat shock or heat stress, which negatively affects plant growth, seed germination, photosynthesis, respiration, water relation, and membrane stability in plants (Wahid et al., 2007), and is often accompanied by the generation of reactive oxygen species (ROS), such as hydrogen peroxide (H2O2), hydroxyl radical, superoxide anion radicals, and singlet oxygen (Liu and Huang, 2000; Mittler, 2002; Apel and Hirt, 2004; Song et al., 2014). The understanding of plant responses to heat stress in physiology, genetics, and molecular biology will be greatly helpful in improving the heat tolerance of plants through genetic engineering. Compared with other ROS, H2O2 is more stable, more diffusive, and have a long half-life (approximately 1 ms) and high permeability across membranes (Levine et al., 1994), so it can readily escape from the organelle where it was produced to the cytosol. Previous research has shown that H2O2 plays a dual role in plants: at low concentrations, it acts as a secondary messenger involved in triggering tolerance to various biotic and abiotic stresses; but at high concentrations, it leads to programmed cell death (Quan et al., 2008). H2O2 also acts as a key regulator in a broad range of physiological processes, such as photorespiration and photosynthesis (Noctor and Foyer, 1998), growth and development (Foreman et al., 2003), the cell cycle (Mittler et al., 2004), senescence (Peng et al., 2005), and stomatal movement (Bright et al., 2006). Stomatal pores that are located in the epidermis of plant leaves control the uptake of CO2 for photosynthesis and the water loss during transpiration, and play a crucial role in abiotic stress tolerance (Schroeder et al., 2001; Hetherington and Woodward, 2003). In the process of ABA-dependent stomatal closure, H2O2 plays a vital role as a signal molecule by elevating calcium levels in guard cells through the activation of plasma membrane calcium channels (Pei et al., 2000; Wang and Song, 2008). OsHTAS, a RING finger ubiquitin E3 ligase, functions in rice heat tolerance through H2O2-induced stomatal closure and is mainly involved in the ABA-dependent pathway (Liu et al., 2016). The ABA-activated SnRK2 protein kinase OPEN STOMATA1 phosphorylates NADP (NADPH) oxidase (AtrbohF), which functions to produce ABA-induced ROS in guard cells (Sirichandra et al., 2009). There’s another way of ABA-independent stomatal closure. 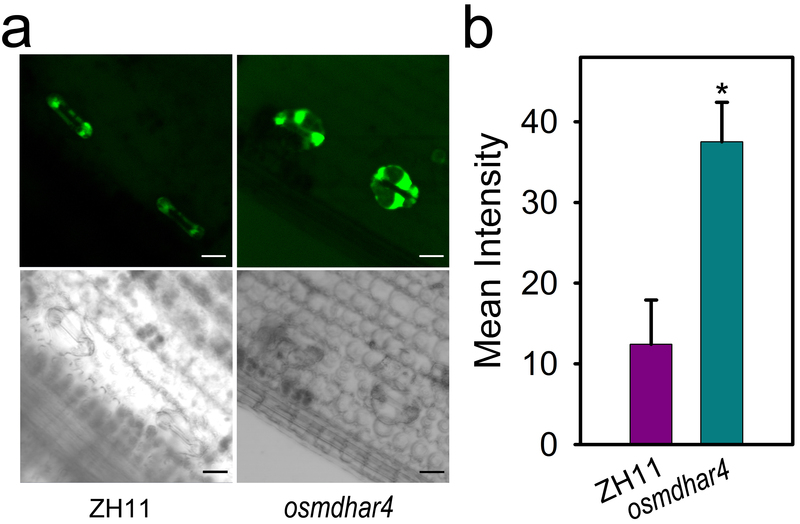 DROUGHT AND SALT TOLERANCE (DST), a zinc finger transcription factor, negatively regulates H2O2-induced stomatal closure by directly regulating the expression of genes related to H2O2 scavenging (Huang et al., 2009). OsSRO1c suppresses DST to positively regulate H2O2-induced stomatal closure (You et al., 2013). ROS is normally scavenged by an enzymatic anti-oxidative system containing catalase (CAT), ascorbate peroxidase (APX), glutathione peroxidase (GPX) and superoxide dismutase (SOD), and by a non-enzymatic anti-oxidative system including ascorbic acid (AsA), glutathione (GSH), tocopherols (TOCs) and phenolic compounds to protect plant cells. The monodehydroascorbate reductase (MDAR or MDHAR), well-known as flavin adenine dinucleotide (FAD) enzyme, is involved in the ascorbate–glutathione cycle, and plays an important role in directly reducing monodehydroascorbate (oxidized ascorbate) to ascorbate using NAD(P)H as an electron donor (Apel and Hirt 2004). MDARs were found in many eukaryotes, including cucumbers, potatoes, soybean root nodules, and rot fungus (Gill and Tuteja, 2010), and were localized in chloroplasts, mitochondria, peroxisomes, and the cytosol in plants (Omoto et al., 2013), and in microsomes, mitochondria, the Golgi apparatus, and erythrocytes in animals (Sakihama et al., 2000). The roles of MDAR have been extensively reported under abiotic and biotic stress. Overexpression of AtMDAR1 in tobacco confers enhanced tolerance to ozone, salt and polyethylene glycol stresses (Eltayeb et al., 2007). Overexpression of LeMDAR from tomato (Lycopersicon esculentum Mill.) enhanced tolerance to temperature and methylviologen-mediated oxidative stresses (Li et al., 2010). OsMDHAR-expressing yeast cells displayed enhanced tolerance to H2O2 (Kim et al., 2016). Silencing OsMDHAR3 gene increased salt sensitivity in rice (Kim et al., 2017). Knockdown of TaMDHAR4 and TaMDAR6 through virus-induced gene silencing (VIGS) enhanced the wheat resistance to Puccinia striiformis f. sp. tritici (Pst) (Feng et al., 2014; Abou-Attia et al., 2016). However, the roles of rice MDAR in heat stress response remain unclear. In this study, a new gene encoding the chloroplastic MDHAR (OsMDHAR4) from the rice plant was cloned, and its function was analyzed. The osmdhar4 mutant displayed significantly improved heat tolerance with increased stomatal closure and reduced water loss by promoting H2O2 accumulation. OsMDHAR4-overexpressing transgenic plants showed obviously enhanced sensitivity to heat stress with decreased stomatal closure and accelerated water loss speed. Our results suggest that the OsMDHAR4 gene negatively regulates resistance to heat stress in rice. The coding sequence (CDS) of OsMDHAR4 gene spans 1431 bp and encodes a protein of 476 amino acids and has a predicted molecular weight of 51.86 kDa. The prediction of protein domains using NCBI and InterProScan databases indicated that OsMDHAR4 protein contains pyridine nucleotide-disulfide oxidoreductase domains (Pyr_redox_2 and NAD(P)-binding domain) and a FAD/NAD-linked reductase, dimerisation domain. The multiple amino acid sequence alignment of OsMDHAR4 and other plant MDHARs was performed using the BLAST tool at the NCBI database. OsMDHAR4 showed 87, 88, 86, 43, 69, 43, 70 and 53% identity and 92, 93, 93, 61, 80, 60, 82 and 69% similarity to ZmMDAR (Zea mays), BdMDAR (Brachypodium distachyon), TaMDHAR4, TaMDAR6 (Triticum aestivum), AtMDAR4, AtMDAR6 (Arabidopsis thaliana), GmMDAR (Glycine max), and SlMDAR (Solanum lycopersicum), respectively (Additional file 1: Figure S1). To study the subcellular localization of OsMDHAR4 protein, we fused the CDS of OsMDHAR4 to the N-terminal of yellow fluorescent protein (YFP) driven by the cauliflower mosaic virus 35S promoter. The empty and recombinant vectors were transiently transformed into the epidermis of Nicotiana benthamiana by agroinfiltration. 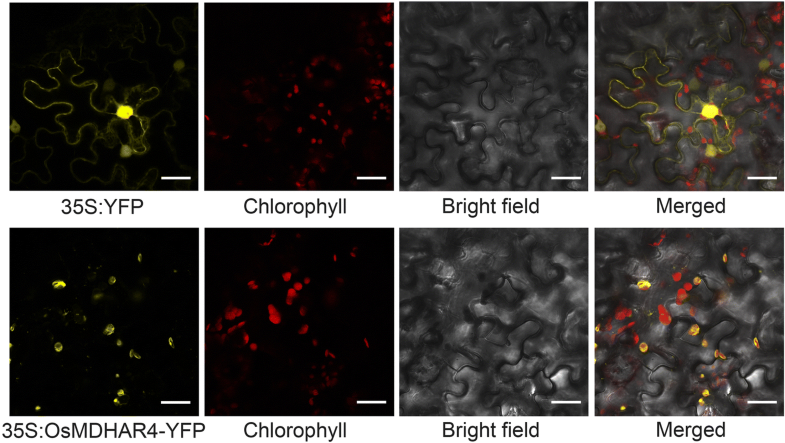 Fluorescence microscopic analysis revealed that OsMDHAR4-YFP was mainly detected in chloroplast, partially colocalized with the red autofluorescence of chlorophyll. On the contrary, 35S-YFP was widely distributed in the nucleus and cytoplasm and was not colocalized with the red autofluorescence of chloroplasts (Fig. 1). This result indicated that OsMDHAR4 protein was localized to the chloroplasts. A total of 6 representative tissues, including root, shoot, stem, sheath and blade of flag leaf, and panicle, were prepared for spatio-temporal expression analysis of OsMDHAR4 in rice Zhonghua11 (ZH11). The mRNA abundance of OsMDHAR4 was detected using quantitative RT-PCR (qRT-PCR). OsMDHAR4 transcripts were detected in all of the tissues surveyed, and the expression level was relatively lowest in root and peaked in the blade of the flag leaf (Fig. 2a). To investigate the physiological and functional relevance of the OsMDHAR4 gene, we further examined the expression level of OsMDHAR4 under heat stress and other treatments, including polyethylene glycol (PEG), abscisic acid (ABA), H2O2, salt and cold, at the seedling stage. It was found that, after heat treatment, the OsMDHAR4 transcripts increased rapidly at 0.5 h (1.8-fold), after which a slight decrease occurred at 3 h, and then they continued to rise and peaked at 24 h (2.8-fold). Under the PEG treatment, the transcript abundance of OsMDHAR4 was nearly unchanged at most time points except for 3 h and 24 h, where two induced peaks (1.7 and 2.2-fold) appeared. In the ABA treatment, OsMDHAR4 was induced quickly at 0.5 h and 3 h, after which a dramatic decrease appeared at 6 h and 12 h, and recovered to initial level until 24 h. When treated with H2O2, the OsMDHAR4 expression showed a significant trend of rising followed by falling. The OsMDHAR4 transcript level was slightly suppressed by salt and cold treatments at 6 h and 12 h (Fig. 2b). These results demonstrated that OsMDHAR4 is responsive to multiple stresses. As shown in Fig. 2b, the expression of OsMDHAR4 was significantly induced by heat treatment, and the positive roles of MDHAR have been extensively reported under abiotic stress such as ozone, salt, PEG (Sharma and Davis 1997; Eltayeb et al.,2007) and drought (Sharma and Dubey 2005). However, the role of the MDHAR gene in rice remains largely unknown. To evaluate the function of OsMDHAR4 in heat stress response, we firstly searched for the Rice Mutant Database (http://rmd.ncpgr.cn/). Then, the osmdhar4 mutant (RMD_03Z11DA36), a transfer DNA (T-DNA) insertion line in the japonica rice ZH11 background was obtained (Wu et al., 2003; Zhang et al., 2006). DNA sequencing and genotyping revealed that the T-DNA was inserted in the first intron of the OsMDHAR4 gene, 254 bp downstream of the translation initiation site (Fig. 3a and Additional file 2: Figure S2). A qRT-PCR assay showed that OsMDHAR4 was expressed at a very low level in the osmdhar4 plants (Fig. 3b). Under normal growth conditions, the osmdhar4 mutant had no obvious differences compared with the wild type (WT, ZH11) (Fig. 3c, left). osmdhar4 and WT seedlings (5.5- to 6.5-leaf stage) were treated at high temperature (45 °C) for 72 h and subsequently returned to 26 °C for recovery. Survival rates were used as a measure of heat tolerance. After the heat treatment and recovery, 80.5% of the osmdhar4 seedlings survived compared with 45.6% of the WT seedlings (Fig. 3c, d). Subsequently, we measured the water loss rates of detached leaves from osmdhar4 and WT. The results showed that the detached leaves of osmdhar4 lost water more slowly than the WT leaves (Fig. 3e). This decreased water loss of the osmdhar4 mutant might lead to an increased tolerance to high temperature. To further validate the functions of OsMDHAR4 in rice, we constructed an overexpression vector of OsMDHAR4 driven by 35S promoter. The OsMDHAR4-overexpressing vector was transformed into rice ZH11. PCR analysis using OsMDHAR4-specific primers (OsMDHAR4-OE-F and R) and vector-specific primers (Hyg-F and R) confirmed the presence of the transgene in the two independent overexpression lines OsMDHAR4-OE-1 and OsMDHAR4-OE-5 (Additional file 3: Figure S3). Both the two transgenic lines, in which the OsMDHAR4 expression level was significantly increased approximately triple and twice of that in WT (Fig. 4a), were selected for heat tolerance testing (45 °C for 48 h at the 5.5- to 6.5-leaf stage). Under normal conditions, we did not observe any phenotypic differences between these two overexpression lines and the WT (Fig. 4b, top). Under the heat stress treatment, both OsMDHAR4-OE-1 and OE-5 were more sensitive than the WT, which was consistent with the behavior of the osmdhar4 mutant in heat treatment. The survival rates ranged from 46.9 to 60.0% for the OsMDHAR4-overexpressing lines, and 90.0 to 90.6% for the WT plants after recovery, but there was no significant difference between OsMDHAR4-OE-1 and OE-5 (Fig. 4b, c). Consistent with this result, detached leaves of OsMDHAR4-overexpressing lines lost water more quickly than the WT leaves (Fig. 4d). Taken together, all of these results suggested that OsMDHAR4 plays a negative role in heat tolerance in rice. The function of OsMDHAR4 in the control of water loss prompted us to investigate the stomatal aperture status, the major factor affecting the water-holding capacity in rice leaves. The stomatal apertures of the osmdhar4 mutant, OsMDHAR4-OE-1 and the WT plants were checked by scanning electron microscopy. No significant differences in the percentages of the three types of stomata and stomatal conductance between the osmdhar4 mutant and the WT were observed before heat stress. However, after heat treatment (45 °C for 24 h at 5.5- to 6.5-leaf stage), the results showed that 56.8% of stomata were completely closed in the osmdhar4 mutant, whereas only 25.0% were completely closed in the WT plants. On the other hand, only 10.5% of stomata were completely open in the osmdhar4 mutant, but 46% were completely open in WT. The percentage of partially open stomata didn’t differ significantly from each other (Fig. 5a, b). Furthermore, the stomatal conductance was dramatically decreased in the osmdhar4 mutant compared the WT plants after heat treatment (Fig. 5c). These results were in agreement with the slower water loss of detached leaves from the osmdhar4 mutant. Either before or after heat treatment, OsMDHAR4-OE-1 plants had lower percentages of completely closed stomata than WT (before, 32.2% for OsMDHAR4-OE-1, 40.4% for the WT; after, 17.2% for OsMDHAR4-OE-1, 30.4% for the WT), while the percentages of completely open were higher than the WT (before, 24.6% for OsMDHAR4-OE-1, 20.1% for the WT; after, 36.6% for OsMDHAR4-OE-1, 25.1% for the WT; Fig. 5d). Moreover, compared with the WT, OsMDHAR4-OE-1 had significantly higher stomatal conductance after heat treatment (Fig. 5e). These results were also in agreement with the faster water loss of the OsMDHAR4-OE-1 plants. ROS are continuously produced as the byproducts of various metabolic pathways and are scavenged by different antioxidative defense components in plants. The equilibrium between ROS production and scavenging may be perturbed by adverse environmental factors, such as heat stress (Apel and Hirt, 2004). As H2O2 is a very stable ROS with a long half-life (Levine et al., 1994) and a signal molecular that induces stomatal closure (McAinsh et al., 1996), so we measured the H2O2 content in the rice seedling leaves. A higher level of H2O2 accumulation was detected in the osmdhar4 mutant either before or after heat treatment (45 °C for 24 h at 5.5- to 6.5-leaf stage, Fig. 6a). The DAB staining results also support the quantitative analysis (Fig. 6b). In addition, more H2O2 accumulation was detected in the guard cells of the osmdhar4 mutant under normal conditions, as indicated by the ROS indicator, H2DCFDA (Additional file 4: Figure S4). Thus, ROS homeostasis in osmdhar4 seedlings was perturbed. These results indicated that the increased stomatal closure in the osmdhar4 mutant was probably due to accumulation of H2O2 in guard cells. As expected, in the OsMDHAR4-OE-1 seedling leaves, visibly less H2O2 accumulation was detected under normal conditions or after heat stress through the quantitative analysis and DAB staining (Fig. 6c, d). Taken together, our results indicated that OsMDHAR4 may negatively regulate H2O2-induced stomatal closure. MDAR has been reported to be distributed widely across kingdoms pointing towards a universal role. In plants, it has been found to localize in chloroplasts, glyoxysomes, mitochondria, and cytosol. Chloroplastic MDAR localizes on the stroma of the chloroplast (Sano et al., 2005) and catalyzes the conversion of monodehydroascorbate (MDA) to AsA. AsA is a major antioxidant molecule that directly neutralizes ROS. Previous research has indicated that overexpression of chloroplastic MDAR from tomato enhanced tolerance to temperature and methyl viologen-mediated oxidative stress (Li et al., 2010). However, the physiological role of the chloroplastic MDAR in rice in response to heat stress is not reported. 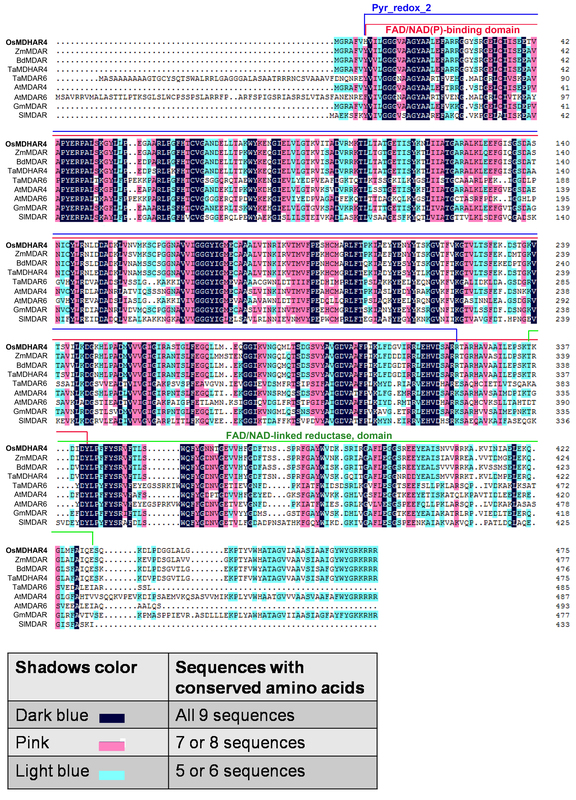 In this study, OsMDHAR4, one new gene encoding monodehydroascorbate reductase was isolated from rice, and its amino acid sequence showed high identity and similarity to the MDAR sequences from several other plant species (Additional file 1: Figure S1). Bioinformatics studies predicted that ZmMDAR and BdMDAR, the two most homologous MDARs from Zea mays and Brachypodium distachyon, were located in the cytoplasm. However, intracellular localization studies using YFP fusion confirmed chloroplast localization of OsMDHAR4 (Fig. 1). Plant chloroplasts are the most significant generators of ROS and proposed to be heat sensors. A large number of chloroplasts are distributed in mesophyll cells (Ishikawa and Shigeoka, 2008; Maruta et al., 2012). OsMDHAR4 transcripts peaked in the blade of flag leaf, in which a lot of mesophyll cells were distributed, while it showed the lowest transcript level in the root (almost with no chloroplasts) (Fig. 2a), the results further confirmed the finding that OsMDHAR4 protein was located in chloroplast. Since 1995, several studies have reported that MDAR genes are regulated by abiotic stresses (Leterrier et al., 2005; Grantz et al., 1995; Eltelib et al., 2011). We found that OsMDHAR4 transcripts were induced by heat and PEG (2.8-fold and 2.2-fold). Under both ABA and H2O2 treatment, the OsMDHAR4 expression levels were increased in first and decreased at last, but salt and cold treatments had almost no effect on these (Fig. 2b). So, we assumed that OsMDHAR4 may function in rice heat resistance. Many scholars have focused on conferring abiotic stress tolerance through the overexpression of MDAR genes. Overexpression of LeMDAR gene alleviated photoinhibition of PSI and PSII and enhanced the tolerance to various abiotic stresses by elevating AsA level (Li et al., 2010). Overexpressing AeMDHAR gene increased MDHAR enzyme activity compared to untransformed plants under both NaCl and control conditions (Sultana et al., 2012). OsMDHAR-expressing yeast cells displayed enhanced tolerance to H2O2 by maintaining redox homoeostasis, proteostasis, and the ascorbate (AsA)-like pool (Kim et al., 2016). In the above studies, we can find that all the MDAR genes play a positive role in response to different abiotic stresses. In our study, we found that disruption of OsMDHAR4 reduced the water loss rates and increased heat tolerance (Fig. 3), and overexpression of OsMDHAR4 accelerated the water loss rates and decreased heat tolerance (Fig. 4). Unlike previous researches, these results showed that OsMDHAR4 plays a negative role in heat tolerance in rice. The importance of maintaining higher levels of AsA over DHA has been reported in previous studies. In transgenic tobacco plants overexpressing cucumber ascorbate oxidase, decreased AsA/DHA ratio increased ozone sensitivity (Sanmartin et al., 2003), whereas a higher AsA/DHA brought about by overexpression of DHAR and MDAR in cytosol resulted in enhanced tolerance to salt stress (Eltayeb et al., 2006). Higher AsA/DHA ratio, higher photosynthetic activity and lower H2O2 contents were reported in transgenic tobacco plants expressing ascorbate oxidase gene (Yamamoto et al., 2005). According to this, we measured the AsA and DHA contents in leaves. Consistently with previous study (Chen et al., 2003), the osmdhar4 mutant showed lower AsA contents and AsA/DHA ratio than the WT before or after heat treatment,and the OsMDHAR4-OE-1 plants showed higher AsA contents and AsA/DHA ratio than the WT before or after treatment (Additional file 5: Figure S5). However, the changes of ascorbate redox state were not be able to explain the increased heat tolerance in the osmdhar4 mutant and incremental heat sensitivity in OsMDHAR4 overexpression lines. Stomata control the exchange of gases-most importantly water vapor and CO2-between the interior of the leaf and the atmosphere, and are involved in responses to abiotic stresses (Hetherington and Woodward, 2003). Stomatal closure degree makes major contribution to the ability of the plant to hold water in rice leaves. H2O2 is an essential signaling molecule involved in the regulation of stomatal movement (Wang and Song, 2008; Yao et al., 2013). Mutation of DST results in the down regulation of peroxidase 24 precursor (Prx-24, a scavenger of H2O2), might lead to the accumulation of H2O2 in guard cells and trigger stomatal closure, and enhances drought and salt tolerance (Huang et al., 2009). Arabidopsis mutants lacking either or both a cytosolic and chloroplastic ascorbate peroxidase (APX), which were responsible for H2O2 removal, were found to be more tolerant to salinity stress (Miller et al. 2007). Recently,one study showed that overexpression of Prx-24 (the target gene of DST) enhanced the sensitivity to drought and salt stress in rice (Cui et al., 2015). In our case, OsMDHAR4 might also be a target regulated by some transcript factors in response to heat stress, more research will be required to address this hypothesis. Liu et al. (2016) found that the oshtas mutant (gain-of-function) showed a strongly enhanced tolerance to heat stress with lower water loss rates, more closed stomata and significantly higher H2O2 contents after the treatment as compared with the WT. Our data also showed that the osmdhar4 mutant had more closed stomata and significantly reduced stomatal conductance after heat treatment. Meanwhile, the osmdhar4 mutant accumulated more H2O2 as compared with the WT before or after heat treatment. All of the above was found to be opposite in the OsMDHAR4 overexpression line (OsMDHAR4-OE-1, Figs. 5, 6). These findings suggested that OsMDHAR4 might play a negative regulation role in H2O2-induced stomatal closure. Our results demonstrated that OsMDHAR4 negatively regulates tolerance to heat stress in rice by promoting H2O2-induced stomatal closure. This study increases our insights into the molecular mechanisms of rice responses to heat stress and may ultimately be helpful for enhancing heat-tolerance via genetic engineering in crop breeding programs. Overexpression transgenic plants and the osmdhar4 mutant were all based on the Oryza sativa L. ssp. Japonica Zhonghua 11 rice background. 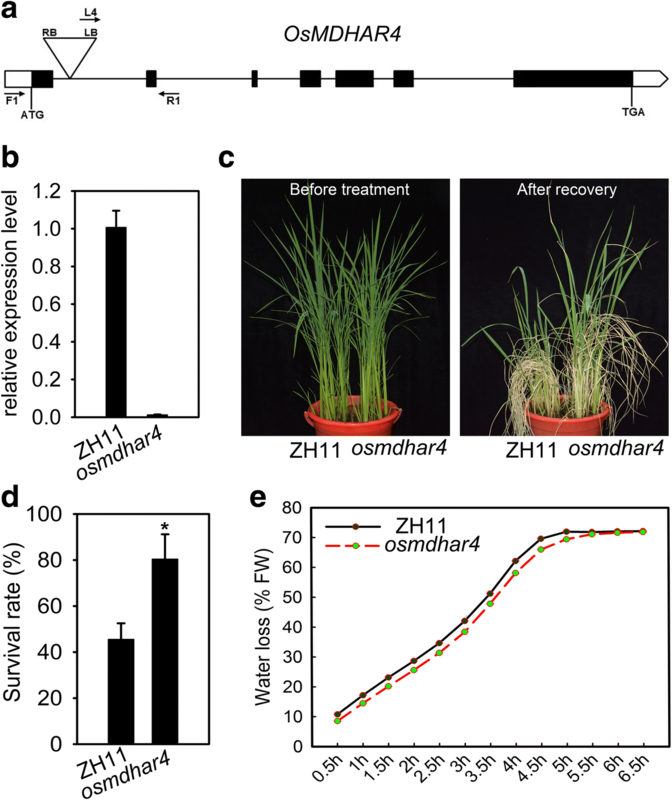 To check the expression levels of the OsMDHAR4 gene under various abiotic stresses or phytohormone treatment, Zhonghua 11 rice plants were grown in Yoshida solution for approximately 3 weeks under normal conditions. 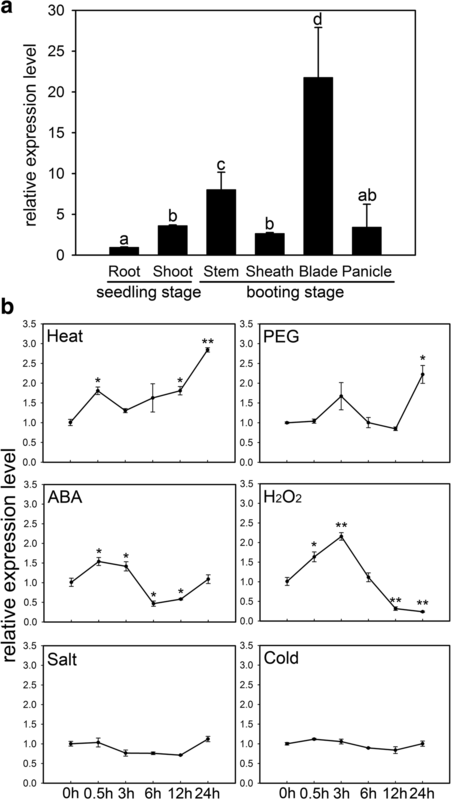 The seedlings at the 3.5- to 4.5-leaf stage were treated with abiotic stresses, including heat stress (exposing plants to 45 °C), simulated drought stress (treated with 20% [w/v] PEG 6000), ABA treatment (100 μM ABA), oxidative stress (treated with 100 mM H2O2), salt stress (treated with 250 mM NaCl), and cold stress (seedlings were transferred to a growth chamber at 4 °C), followed by sampling at the designated time points (0 h, 0.5 h, 3 h, 6 h, 12 h and 24 h). We prepared each RNA sample with shoots from at least four seedlings and ensured that every sampled seedling was of the same growth stage. Before treatment, OsMDHAR4-overexpressing transgenic plants were firstly selected by germinated seeds on 1/2 MS medium containing 50 mg L− 1 hygromycin, WT and the osmdhar4 mutant were grown on normal 1/2 MS medium 1 d later. For heat stress testing, the uniformly germinated seeds were sown in the same barrels filled with a well-mixed soil, which was then cultured in a growth chamber with a 13-h-light (28 °C)/11-h-dark (25 °C) photoperiod, 70% humidity. The 5.5- to 6.5-leaf stage seedlings were transferred to a growth chamber with a 13-h-light (45 °C)/11-h-dark (45 °C) photoperiod, 70% humidity for 48 h or 72 h. The treated seedlings were transferred back into the previous growth conditions for recovery, and seedlings with newly growing leaf blades were then counted as surviving plants. To generate the overexpression construct, the full-length CDS of OsMDHAR4 was amplified from the cDNA of Zhonghua 11 by PCR. The PCR fragment was inserted into vector pEXT06/g (target gene driven by 35S promoter). The resulting construct was then confirmed by sequencing and transformed into Zhonghua 11, a japonica rice that can be easily transformed, by the Agrobacterium tumefaciens-mediated co-cultivation method. Transformed calli were selected on hygromycin medium. The primers used in this work are listed in Additional file 6: Table S1. Coding sequence of the OsMDHAR4 gene was amplified by PCR and directionally inserted into pCAMBIA1300-35S:YFP-NOS vector. The cultures of the Agrobacterium tumefaciens strain EHA105 harboring empty and recombinant vector were used to infect the healthy leaves of Nicotiana benthamiana (4 weeks old). The fluorescence signals were observed using a confocal microscope (Leica TCS SP5 or Zeiss LSM710). The primers used in this work are listed in Additional file 6: Table S1. The TRIZol reagent (Invitrogen, USA) was used according to the manufacturer’s instructions to extract total RNA. Before reverse transcription, total RNA was treated with gDNA Eraser (TaKaRa, Japan) for 5 min at 42 °C to degrade possibly contaminated residual genomic DNA. The cDNA templates were synthesized using PrimeScript™ reagent Kit (TaKaRa, Japan) according to the manufacturer’s instructions. Quantitative real-time PCR was performed on an optical 96-well plate with a CFX96 Real-time PCR Detection System (Bio-Rad, USA) using SYBR Premix Ex Taq (TaKaRa, Japan). The PCR thermal cycling protocol was as follows: 95 °C for 10 s, followed by 40 cycles at 95 °C for 5 s and 60 °C for 30 s. Gene-specific primers for OsMDHAR4 were designed using the Roche Web site (Roche Applied Science). The rice Actin1 was used as the internal reference (Zhang et al., 2012), and data analyses with the 2–ddCt method were performed as described (Livak and Schmittgen, 2001). The primers used in this work are listed in Additional file 6: Table S1. Leaves harvested from 3.5- to 4.5-leaf stage seedlings, with or without heat treatment, were used to measure H2O2 contents. The contents were measured spectrophotometrically after reaction with potassium iodide (KI). The reaction mixture consisted of 0.5 ml of 0.1% trichloroacetic acid (TCA), leaf extract supernatant, 0.5 ml of 100 mM potassium phosphate buffer (pH 7.8) and 1 ml reagent (1 M KI, w/v in fresh double-distilled water). The blank control consisted of 1 ml 0.1% TCA and 1 ml KI in the absence of leaf extract. After 1 h of reaction in darkness, the absorbance was measured at 390 nm. The amount of H2O2 was calculated using a standard curve prepared with known concentrations of H2O2. 3,3′-Diaminobenzidine (DAB) staining was performed following a published method with some modifications (Liu et al., 2014). Rice seedlings at 5.5- to 6.5-leaf stage were treated with a 45 °C high temperature for 24 h or not treated, then the leaves (3–5 mm in width) at the same position were detached and immersed in 1% 3,3′-diaminobenzidine (DAB) solution in HCl-acidifed (pH 3.8). After 30 min under vacuum the samples were incubated at room temperature for 24 h in the dark. The samples were then bleached by boiling in ethanol in order to remove the chlorophyll and reveal the brown spots, which are indicative of the reaction of DAB with H2O2. The samples were observed and imaged under a scanner. H2O2 production in guard cells was detected using 2′,7′-dichlorodihydrofluorescein diacetate (H2DCFDA; Molecular Probes) as described previously (Huang et al., 2009) with small modifications. Leaves of 5.5- to 6.5-leaf stage seedlings were immerged in 0.01% Tween-20 and vacuum-infiltrated for 10 min. After rinsing twice with distilled water, leaves were incubated in 3% (w/v) cellulase RS (Yakult Honsha, Japan) for 5 h at 40 °C without shaking to facilitate peeling off the epidermal strips. The epidermal strips were peeled off from leaves using tissue forceps. After washing with loading buffer (10 mM Tris-HCl, 50 mM KCl at pH 7.2), the epidermal strips were incubated in staining buffer (loading buffer containing 50 mM H2DCFDA) for 10 min at room temperature in the dark. The epidermal strips were washed with distilled water to remove the excess dye. The fluorescence was examined using a confocal laser-scanning microscope (Leica TCS SP5, Germany). All confocal images were taken under identical conditions and the guard cell region was selected to quantify the mean grey value of guard cells. Leaves of 3.5- to 4.5-leaf stage plants with or without heat treatment for 24 h were fixed with 2.5% (v/v) glutaraldehyde, and stomatal images (20 kV, 2000×) were obtained using scanning electron microscopy (KYKY-EM3200). Plants germinated under normal conditions for 4 weeks. The leaves were detached from various lines with same age and position, and weighed immediately as the initial fresh weight. They were then placed in clean filter papers, and incubated at 25 °C. The decreases in fresh weight were recorded at every 30 min for 6.5 h or 7 h. Water loss was presented as percentage of fresh weight loss versus the initial fresh weight. Leaves harvested from 3.5- to 4.5-leaf stage seedlings, with or without heat treatment, were used to measure the total AsA (tAsA), AsA and DHA contents determined by the spectrophotometric method described previously (Gillespie and Ainsworth, 2007), with minor modifications. The frozen leaf samples were ground with inert sand and 10% trichloroacetic acid (TCA) solution using a mortar and pestle. The homogenate was centrifuged at 12,000 rpm for 20 min. The tAsA contents were determined in a reaction mixture consisting of crude extract and 150 mM KH2PO4 buffer (pH 7.4) containing 5 mM EDTA and 10 mM dithiothreitol (DTT) for the reduction of DHA to AsA. The reaction mixtures were incubated at room temperature for 10 min and 0.5% N-ethylmaleimide (NEM) was added. AsA was assayed in a similar manner, except that deionized H2O was substituted for DTT and NEM. The color was developed in both the reaction mixtures by the addition of 10% TCA, 44% o-phosphoric acid, α,ά-dipyridyl in 70% ethanol, and 30% FeCl3. The reaction mixtures were incubated at 37 °C for 1 h and quantified spectrophotometrically at 525 nm. This work was supported by the National Natural Science Foundation of China (Grant number: 31601232, 31761130073), the Natural Science Foundation of Fujian Province (Grant number: 2017 J05046), China Postdoctoral Science Foundation (Grant number: 2017 M612108) and Research Grant of Fujian Agriculture and Forestry University (Grant number: KXGH17005). The authors would like to thank Prof. Jumin Tu (Zhejiang University) for providing the plasmid for subcellular localization. This study was supported by the National Natural Science Foundation of China (Grant number: 31601232, 31761130073), the Natural Science Foundation of Fujian Province (Grant number: 2017 J05046), China Postdoctoral Science Foundation (Grant number: 2017 M612108) and Research Grant of Fujian Agriculture and Forestry University (Grant number: KXGH17005). LJP, XWF and ZJH contributed to the experimental design. LJP, SXJ, XFY, ZYJ, ZQ and MR contributed to experiment performance and data analysis. LJP, XWF and ZJH drafted the manuscript. LJS contributed to good advice on designing the experiment. All authors read and approved the final manuscript.